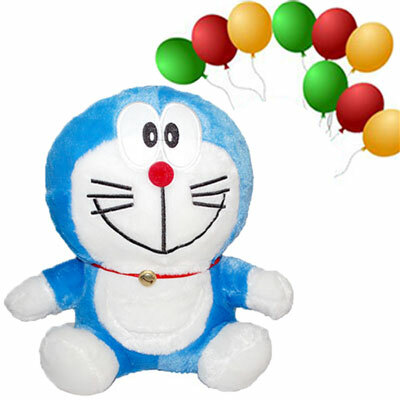 Doraemon - BST -3751-003 Height:30cm + 25 Round Shape blown balloons NOTE: LEAD TIME FOR SHIPPING: 1 WORKING DAY. 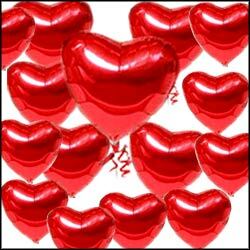 Blown Balloons will be delivered Either in round or Heart shape depending on stock. Deliveries within Hyderabad, Secunderabad, Guntur, Bangalore, Chennai, Vizag and Vijayawada only. 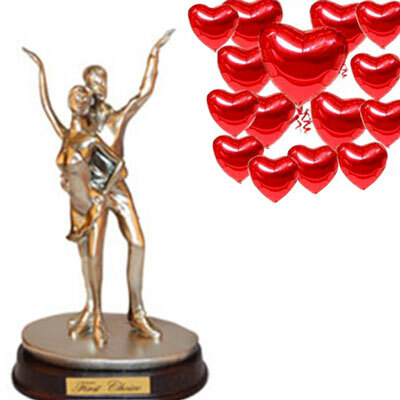 Pop Pair (Code 19825) - (Height: 8 inches) + 25 Heart Shape Blown Balloons NOTE: LEAD TIME FOR SHIPPING: 1 WORKING DAY. 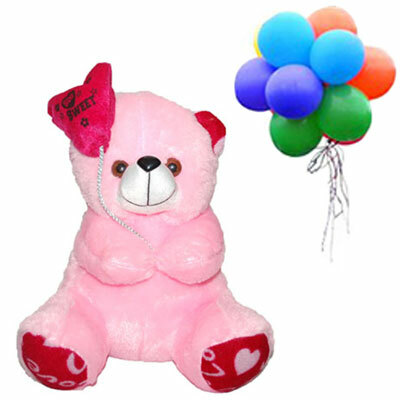 Blown Balloons will be delivered Either in round or Heart shape depending on stock. Deliveries within Hyderabad, Secunderabad, Guntur, Bangalore, Chennai, Vizag and Vijayawada only. 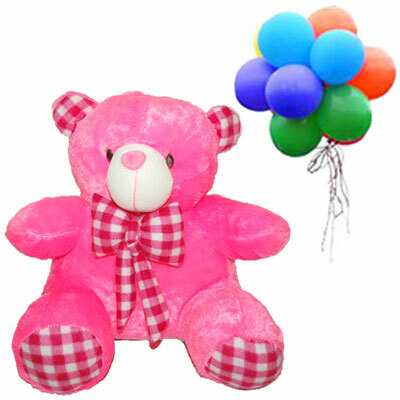 White Color Love Teddy - BST 3602 Height: 20 cm +25 Round Shape blown balloons NOTE: LEAD TIME FOR SHIPPING: 1 WORKING DAY. 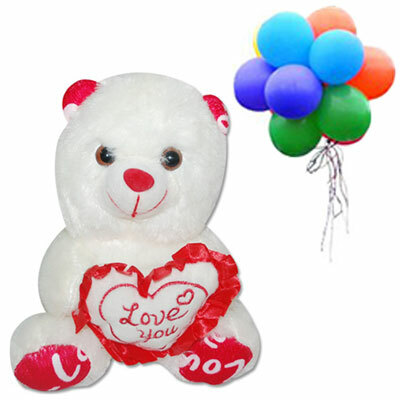 Blown Balloons will be delivered Either in round or Heart shape depending on stock. Deliveries within Hyderabad, Secunderabad, Guntur, Bangalore, Chennai, Vizag and Vijayawada only. 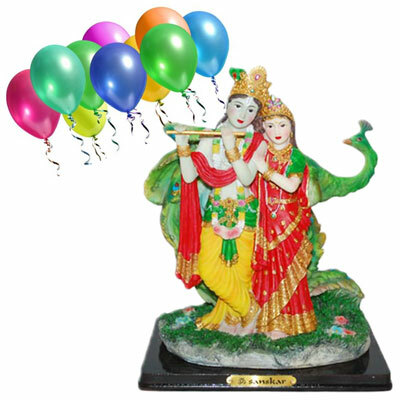 Radha Krishna with Peacock Idol (Vedantha) - Size : 11cm*27cm +25 Round Shape blown balloons NOTE: LEAD TIME FOR SHIPPING: 1 WORKING DAY. 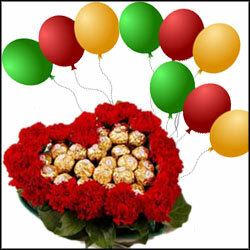 Blown Balloons will be delivered Either in round or Heart shape depending on stock. Deliveries within Hyderabad, Secunderabad, Guntur, Bangalore, Chennai, Vizag and Vijayawada only. 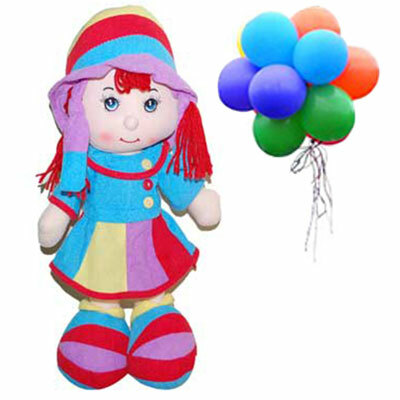 Soft Doll Red color - BST3622-003 Height: 60 Cm +25 Round Shape blown balloons NOTE: LEAD TIME FOR SHIPPING: 1 WORKING DAY. Blown Balloons will be delivered Either in round or Heart shape depending on stock. Deliveries within Hyderabad, Secunderabad, Guntur, Bangalore, Chennai, Vizag and Vijayawada only. 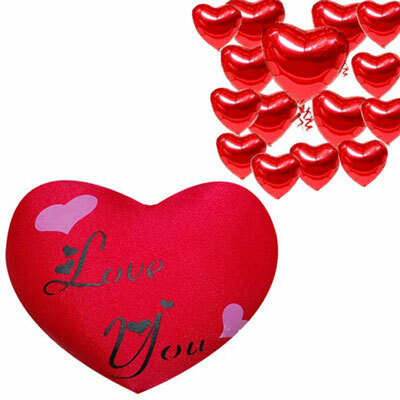 Heart Shape Pillow with message - PST -735 Size :13CM*10 CM + 25 Heart Shape Blown Balloons NOTE: LEAD TIME FOR SHIPPING: 1 WORKING DAY. Blown Balloons will be delivered Either in round or Heart shape depending on stock. 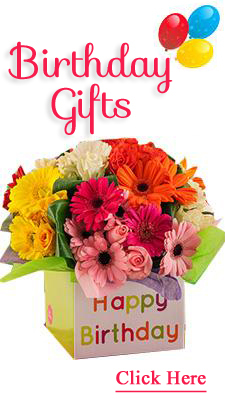 Deliveries within Hyderabad, Secunderabad, Guntur, Bangalore, Chennai, Vizag and Vijayawada only. 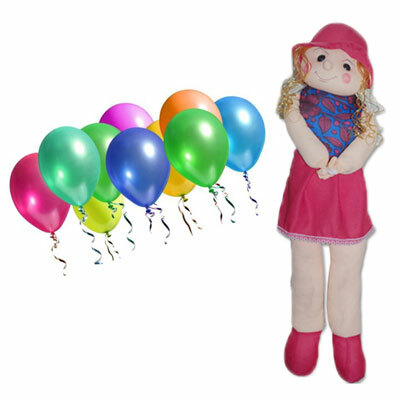 Soft Doll -BST 3703L -002 Height: 32 cm + 25 Round Shape blown balloons NOTE: LEAD TIME FOR SHIPPING: 1 WORKING DAY. 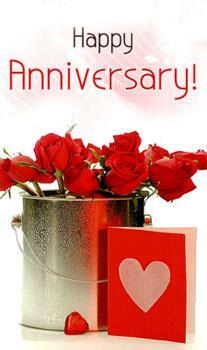 Blown Balloons will be delivered Either in round or Heart shape depending on stock. 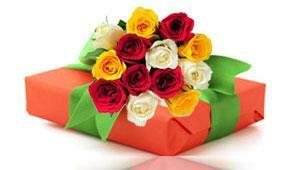 Deliveries within Hyderabad, Secunderabad, Guntur, Bangalore, Chennai, Vizag and Vijayawada only. 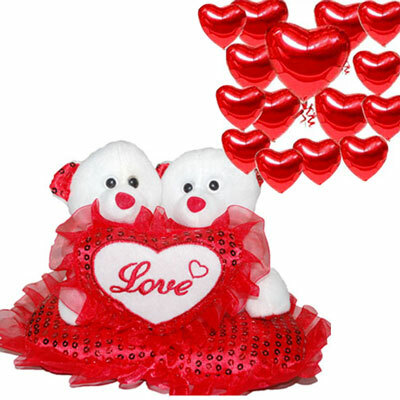 Valentine Teddies -13102-006 Size :22cm *18cm + 25 Round Shape blown balloons NOTE: LEAD TIME FOR SHIPPING: 1 WORKING DAY. 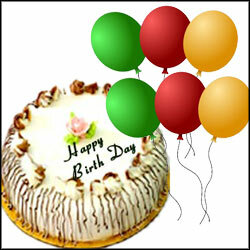 Blown Balloons will be delivered Either in round or Heart shape depending on stock. 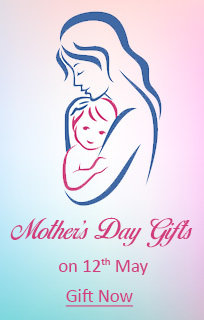 Deliveries within Hyderabad, Secunderabad, Guntur, Bangalore, Chennai, Vizag and Vijayawada only. 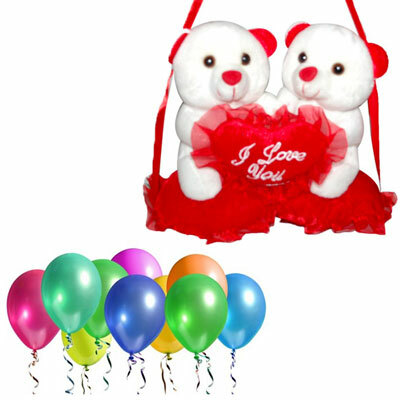 White Teddy - BST-3904 Height:38cm + 25 Heart Shape Blown Balloons NOTE: LEAD TIME FOR SHIPPING: 1 WORKING DAY. 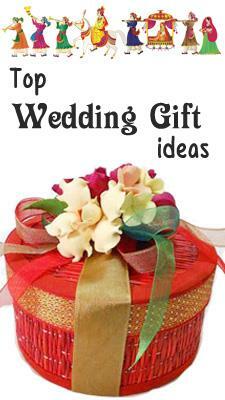 Blown Balloons will be delivered Either in round or Heart shape depending on stock. Deliveries within Hyderabad, Secunderabad, Guntur, Bangalore, Chennai, Vizag and Vijayawada only. Heart shape pillow - BST 13107- 012 (Soft toy) Size :24cm * 15cm + 25 Round Shape blown balloons NOTE: LEAD TIME FOR SHIPPING: 1 WORKING DAY. Blown Balloons will be delivered Either in round or Heart shape depending on stock. Deliveries within Hyderabad, Secunderabad, Guntur, Bangalore, Chennai, Vizag and Vijayawada only. 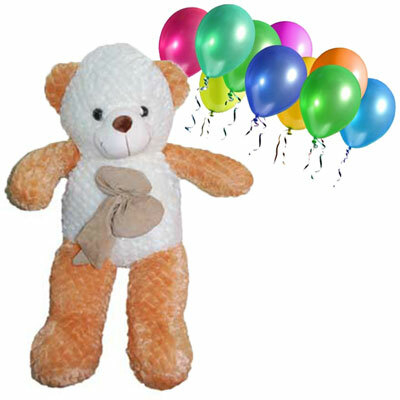 White and Brown Color Teddy Bear -BST 3705-003, Height:70 cm + 25 Round Shape blown balloons NOTE: LEAD TIME FOR SHIPPING: 1 WORKING DAY. Blown Balloons will be delivered Either in round or Heart shape depending on stock. Deliveries within Hyderabad, Secunderabad, Guntur, Bangalore, Chennai, Vizag and Vijayawada only. 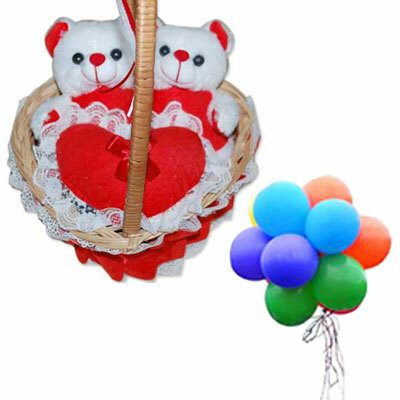 Couple Teddy - KT 099-003 + 25 Round Shape blown balloons NOTE: LEAD TIME FOR SHIPPING: 1 WORKING DAY. Blown Balloons will be delivered Either in round or Heart shape depending on stock. Deliveries within Hyderabad, Secunderabad, Guntur, Bangalore, Chennai, Vizag and Vijayawada only. 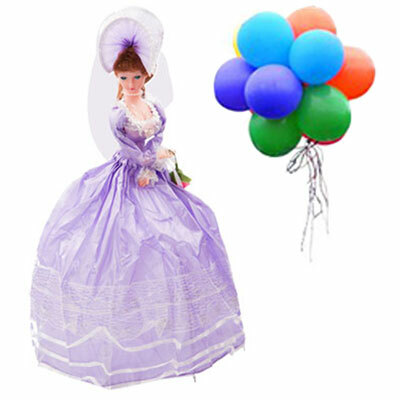 Musical Dancing N Rotating Umberlla Doll (Purple Color) + 25 Round Shape blown balloons NOTE: LEAD TIME FOR SHIPPING: 1 WORKING DAY. Blown Balloons will be delivered Either in round or Heart shape depending on stock. Deliveries within Hyderabad, Secunderabad, Guntur, Bangalore, Chennai, Vizag and Vijayawada only. 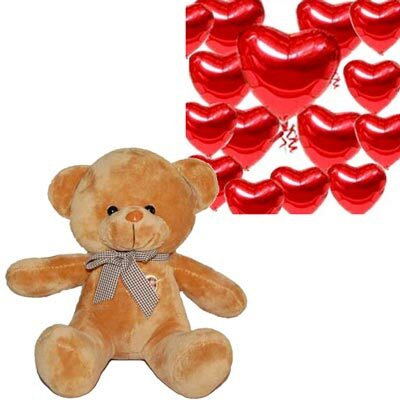 Valentine Teddies -13101 Size :24cm *15cm + 25 Heart Shape Blown Balloons NOTE: LEAD TIME FOR SHIPPING: 1 WORKING DAY. Blown Balloons will be delivered Either in round or Heart shape depending on stock. Deliveries within Hyderabad, Secunderabad, Guntur, Bangalore, Chennai, Vizag and Vijayawada only. 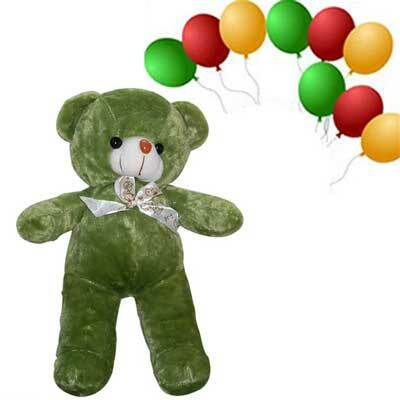 Green Teddy Bear - BGB-304-1 HEIGHT:40 CMS + 25 Round Shape blown balloons NOTE: LEAD TIME FOR SHIPPING: 1 WORKING DAY. Blown Balloons will be delivered Either in round or Heart shape depending on stock. Deliveries within Hyderabad, Secunderabad, Guntur, Bangalore, Chennai, Vizag and Vijayawada only. 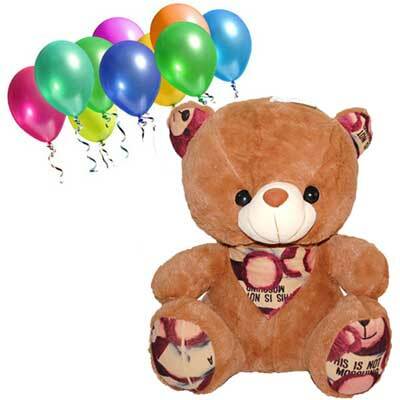 Brown Teddy -BST 4009-002 Height: 30cm + 25 Round Shape blown balloons NOTE: LEAD TIME FOR SHIPPING: 1 WORKING DAY. 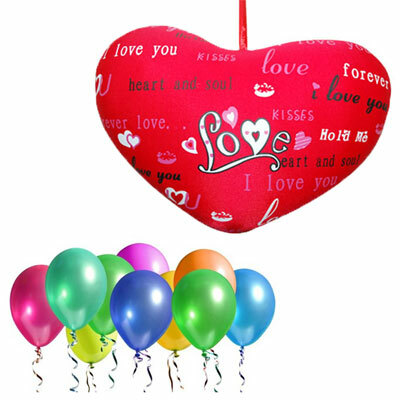 Blown Balloons will be delivered Either in round or Heart shape depending on stock. 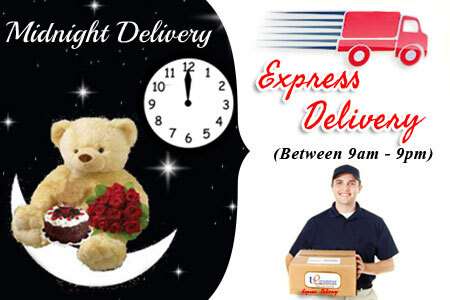 Deliveries within Hyderabad, Secunderabad, Guntur, Bangalore, Chennai, Vizag and Vijayawada only.